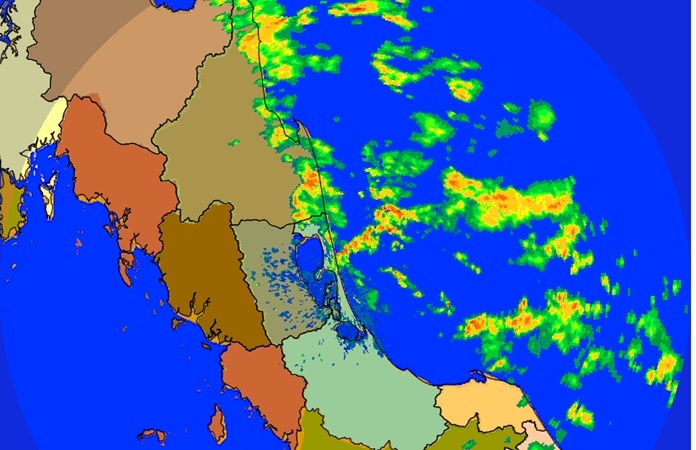 Songkhla – The Governor of Songkhla has instructed related agencies to monitor potential flooding this week. Governor Weeranand Pengchan said that the Disaster Prevention and Mitigation Operation Center has advised southern provinces to expect initial flooding and heavy winds up to and including December 12 in Ranong, Phang Nga, Krabi, Surat Thani, Nakhon Si Thammarat, Songkhla, Pattani, and Narathiwat. Weeranand has urged all 16 districts to inform residents of the latest weather updates and prepare flood assistance measures. Measures include emptying canals, trimming trees, reinforcing flood barriers, safeguarding property, and deploying flood mitigation equipment. Those in need of assistance can call the 24-hour numbers 07-431-6380 and 07-431-6384.